A recent local find by us, Quiet Company, are playing a show at Antone’s on Friday night and have some surprises in store. To start off, the band will be joined on the stage by fellow locals The Mercers, Zookeeper, and Wiretree as openers. Tickets will cost you $10 online or $15 for a ticket and a CD. 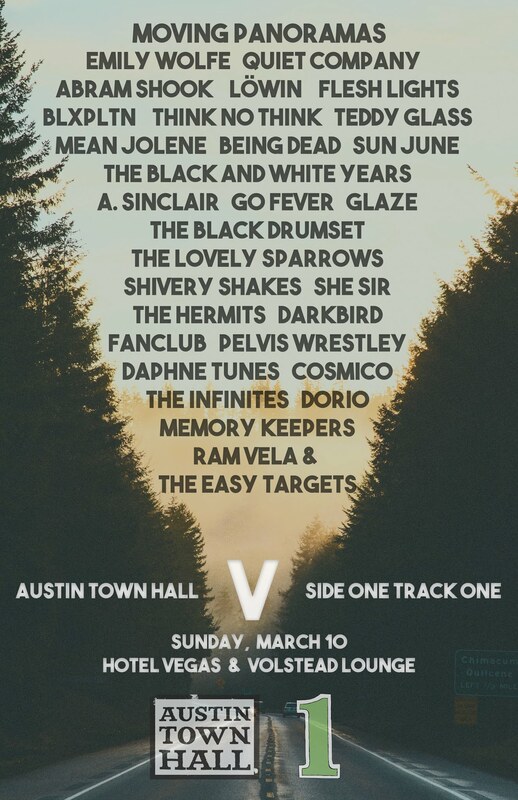 To make things more enticing, the band has a deal with do512 that allows you to get a free 9 song EP, a chance to win tickets, and a 50% off deal just be liking the event. Like they could do anything else to make you want to go. Do it!!! Spiral Stairs is Scott, one of the founding fathers of Pavement, so you can already label us stoked on the news of his solo release this October on Matador Records. The album is titled The Real Feel, and it features various artists making guest appearances, including Austin’s own Ian Moore. Some guy named Kevin Drew is on there as well. Sit back and enjoy the brightness of this new tune by Spiral Stairs. The indie-folk music has been getting a lot of attention on our site recently and a new Avett Brothers song just means that the genre will be getting more attention from us. This new song “I and love and You” will appear on an album of the same name due out September 29th via Columbia. Anyone want to offer some first opinions? No not that terrible movie with Kate Hudson… Fool’s Gold is a brand new collective/band hailing from the big city of Los Angeles. We call the band a collective because it started out as more of a side project of sorts and has since moved into a huge band full of artists with mixed musical influences. You’ll find members of Foreign Born, a former We Are Scientists drummer, a member of The Fall, and tons of other talented musicians. You can expect debut self-titled full length from the band September 29th via IAMSOUND Records. Suffice to say that I really enjoy really clean indie-pop, especially when it’s done like the band Hiawata! does. They’re another Scandinavian bunch just pumping out good tunes, and the track we’re throwing out below will come out on their new album These Boys and This Band is All I Know. This track put me down sounds a little bit like taking the vocals from Beulah and making them run through a maze of 90s radio pop like Tripping Daisy. If you’re ready for a night of face melting rock for cheap, head over to Beauty Bar for a set by local boys Scorpion Child. The shows kicks off around 10pm and will run you $5 at the door. Fellow local rockers Ringo Deathstarr and Spain Colored Orange will be providing your opening entertainment. It’s rare that the ATH gives much mention to hip-hop, but when an artist like Talib Kweli comes to town, we’ve got to get the word out. Having seen the man in action before, I can tell you that a ticket will be well worth the cost of admission and not at all what you’d expect from the usual boring rap show. Several openers are involved including Strong Arm Steady, Zeale, Traygod, and local Bavu Blakes hosting the thing. Tickets are on sale now for $15 and music starts at 10pm. During SXSW we took it upon ourselves to investigate the hype generated by San Francisco’s Girls. Lucky for us, they completely lived up to the hype, if not rising above and beyond. Now we finally have a release date for their debut, Album, which will be released on True Panther Records via Matador Records. The album comes out on September 22nd, and the following song “Lust for Life” is slated as the opening track. Look out album of the year, here come Girls. I’m really psyched on this band The Drums right now. Of course, they come to us via New York City. I’m not really surprised by that, but their sound doesn’t sound precisely like the rest of the bands using the wall of sound technique. Just check out the bobbing bass line that runs throughout the song “Let’s Go Surfing” that’s down below. You can pick up this song and seven other right now off the groups self-titled EP. They have a new Summertime EP coming our way on August 4th. Pogo…you know you wanna. Over the weekend recent ATH fave What Laura Says recorded a live session on one of our favorite websites Daytrotter over the weekend. The live set features 4 songs and includes this awesome unreleased version of “I Suppose”. Check out the whole thing now and tell us what you think.